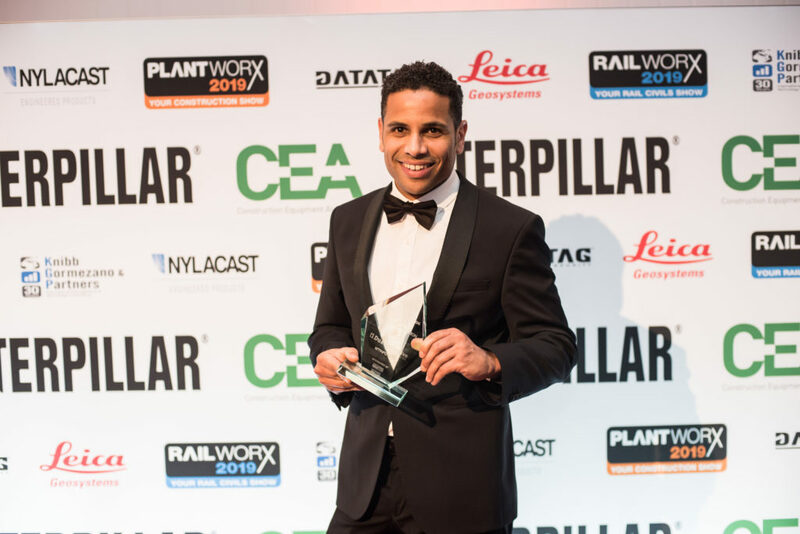 Several railway engineering companies featured strongly at the recent Plantworx Innovation Awards, and several others of the innovations that were applauded have obvious applications in the sector. 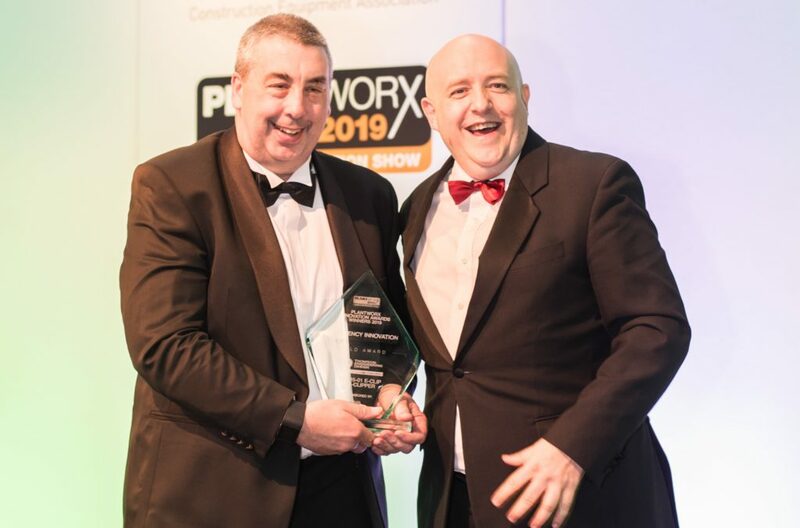 These were indications of the stronger links between Plantworx organiser the Construction Equipment Association and the rail industry, which has brought about the inaugural Railworx show, taking place at Peterborough in June. Now in its fourth year, interest in these awards has grown since they were first held in London at the home of former Prime Minister William Gladstone. This year the venue had changed, moving north to Peterborough, the new home for the Plantworx show. As these are Innovation awards, all entries (except for the Skills & Training category) had to be new to market within the last year. Entries were invited from all Plantworx and Railworx exhibitors. 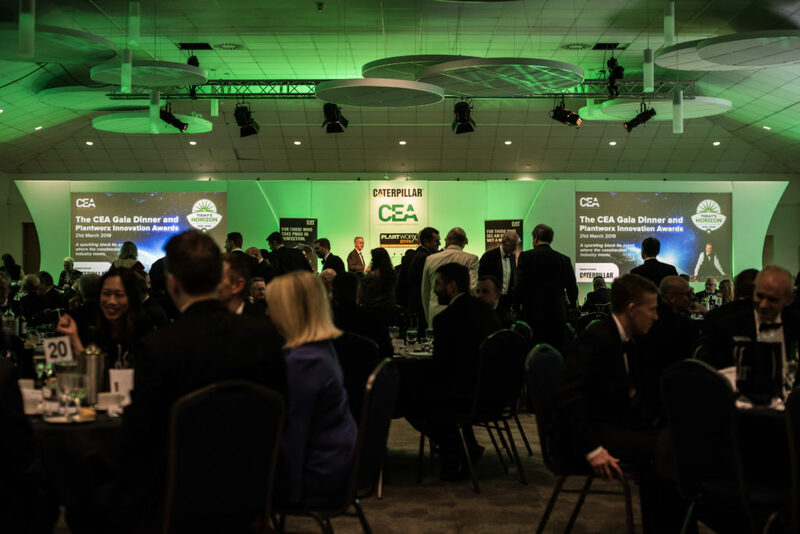 The 2019 Plantworx Innovation Awards attracted 120 entries reflecting the interest in innovation that is now prevalent throughout the industry, and representative from many of those companies, along with industry guests, gathered at the CEA’s annual black-tie dinner to hear how they had done. With eight categories to be announced there was plenty of chances for success. 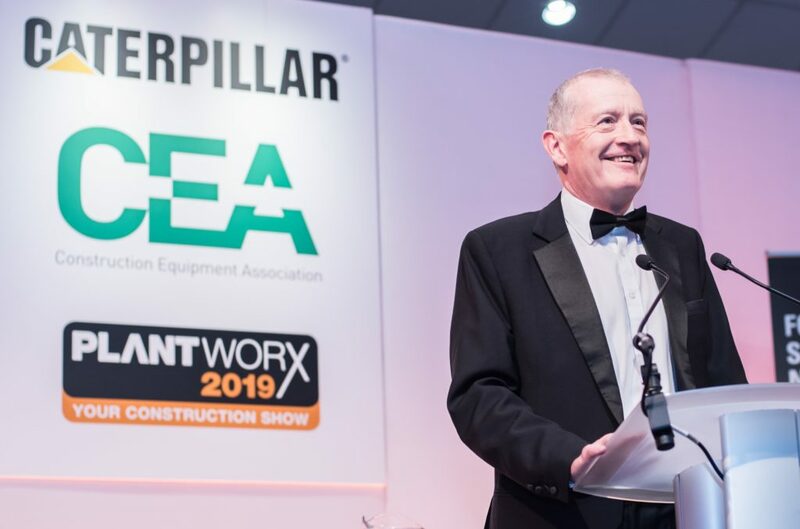 Six-times world snooker champion Steve Davis at the 2019 Plantworx Innovation Awards. After dinner, snooker legend Steve Davis took to the stage to provide the evening’s entertainment. Steve talked about playing snooker during the sport’s heyday in the 1980s, attempts to fight off the ‘boring’ persona that the media built up of him, meetings with the Queen and talking about butter with Joey Essex in I’m A Celebrity… Get Me Out Of Here! Then is was time for the most eagerly awaited part of the evening – the awards themselves. The first to be announced was the award for Commitment to Skills and Training. Nine companies were on the shortlist for this one, which was to be presented to the company that had demonstrated a commitment to investments in training in personnel across all levels of the business or offering unique training to companies within the sector. 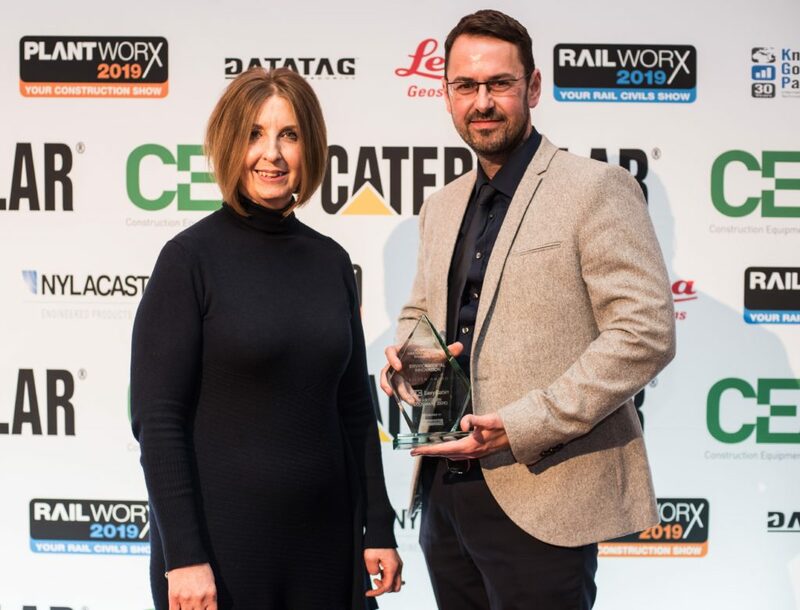 This year’s judging panel, which included executives from the industry, the specialist press and Network Rail, had thought long and hard about this one as, without a skilled and well-trained workforce, the industry would not be able to make the progress that it is doing. Attracting the first thunderous applause of the evening, snooker legend Steve Davis OBE announced that the Gold winner was Nylacast. 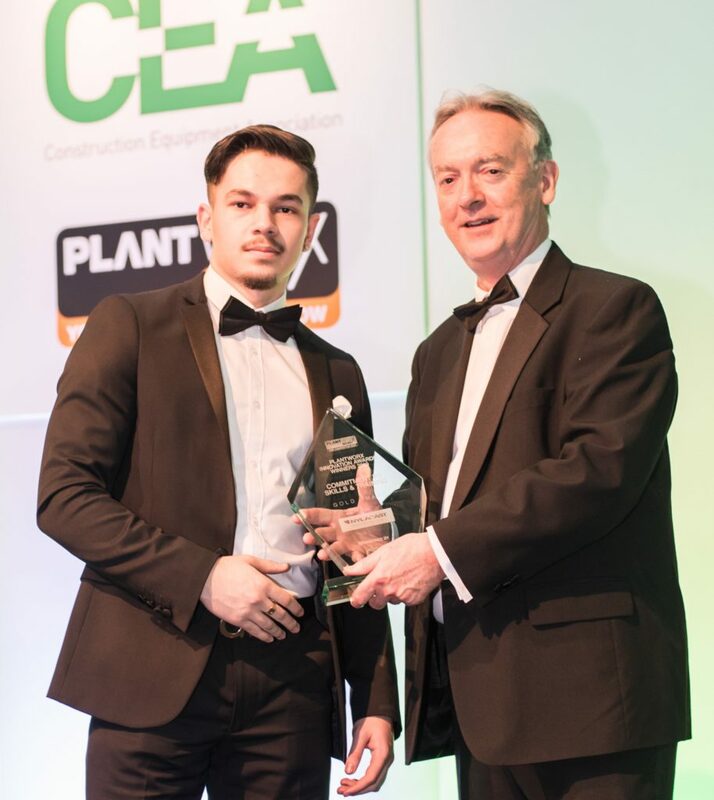 Nylacast Sales apprentice Tibor Mikula receiving the Gold award for Commitment to Skills and Training from CEA’s CEO, Rob Oliver. One of the world’s leading manufacturers of engineering polymers, Nylacast works with manufacturers of engineering equipment to replace traditional engineering materials, such as steel, cast iron, bronze and ceramics, with its wide range of engineering polymers. Recognising the need to actively combat the skills shortage within engineering, Nylacast established a robust, rigid apprenticeship program in 2011 and to invest in a dedicated engineering training academy. The company now takes on 8-12 new apprentices each year and, to date, 35 apprentices have graduated from students to engineers. Silver was presented to leading equipment-hire company A-Plant. With over 190 service centres nationwide, and a workforce of over 3,600 people, the company carried out an impressive 15,000 training days for staff over the last 12 months, delivering over 70 different training courses to help A-Plant staff reach their full potential. Wherever possible, this training is accredited and certified and trainers work alongside several partners and NVQ awarding bodies so that employees have the opportunity to gain an external qualification. Bronze went to construction equipment manufacturer Mecalac, which has adopted a training initiative that encompasses every stage of the education system, from primary schools right up to universities, and even includes training modules for experienced employees of Mecalac to learn new skills and competences. The Siltbuster team collecting the Silver award in the Digital category for its Clarityonline, real-time water-quality monitoring and reporting system. Sponsored by Leica, and one of the new awards for this year, this award was open to all innovative developments that use digital technology to improve any aspect of performance, efficiency or safety. It recognises that digital technology is taking over every aspect of the industry, whether it be automation, control, data collection, planning or operations. A good entry of twelve nominations was received, but the judges assessed that the outstanding one, and recipient of the Gold award, would be Bomag, well-known as a leading manufacturer of machines for the compaction of soils, asphalt and refuse. Bomag rollers have even been fitted with road-rail conversions so they can travel along the railway to sites where they compact ballast ready for track relaying. In this instance, the award was for Bomap – the ‘Bomag app’ that is compatible with standard smartphones and tablets and is revolutionising the way compaction documentation is carried out today. It follows the “Bring-your-own-device” approach and therefore feels familiar right from the start and makes adoption of the technology much easier. Ready to go within seconds, Bomap can be used with the internal GPS of the mobile device but also can be equipped with a high-precision GPS receiver when more precise documentation is required. Clarity, an online, real-time water quality monitoring and reporting system from leading water treatment specialist Siltbuster, won the Silver award. Designed with the end user in mind, Clarity not only eliminates the chance of a company inadvertently releasing polluting water back to the environment, reducing the chance of prosecution and fines in the process, but also provides ‘real time’ assurance for senior managers who are responsible for the environmental performance of their business. Despite the large entry, the judges decided to set the bar very high this year, and so they only gave these two awards. David Thomsom of Thomson Engineering collecting the Gold Award for Efficiency from Alex Woodrow of category sponsor Kinbb Gormezano & Partners. The Efficiency Innovation award, sponsored by Knibb Gormezano & Partners, was for companies who were able to demonstrate how their product or service could improve the efficiency of the construction operation, whether it be by organising people, machinery or the supply chain or by completing a task faster or using less manpower and machinery. Thomson Engineering developed and manufactures its EDC15-01 De-Clipper in the UK. It is a heavy-duty attachment for road-rail vehicles that is used for the safe and efficient removal of Pandrol ‘E’ and ‘PR’ clips. Removing traditional Pandrol clips has always been a slow and labour-intensive and risky task, with reports of back strain, repetitive strain injury, hammer strikes to legs and feet and workers being struck by flying clips, ballast or surrounding debris. Deploying Thomson Engineering new De-Clipper enables the rapid removal of Pandrol E-Clips and PR Clips with no manual intervention. Equipped with Twin Hydraulic circuits it can be used for the removal of clips on one rail or both at speeds of up to 2.5km/h, greatly increasing the work rate possible in the time available. The enclosed mechanism also prevents the released clips from flying across the worksite and the risks therefrom. With the on-track time available for any form of maintenance works on railways always in short supply, the judges felt that this new attachment significantly improved both safety and efficiency in the permanent way maintenance industry. The new tool also addresses several of the health and safety issues of the steel fixer industry with regard to repetitive strain on the forearms and wrist. It helps reduce the possibility of Carpal Tunnel Syndrome, caused by the twisting motion and snapping of the finished tie, and it also features a ‘walking stick’ attachment that goes on the end of the tool with the trigger being held whilst standing in an upright position to prevent musculoskeletal disorders to the lower back. Bronze went to Caterpillar’s new range of 1-2 tonne mini-excavators, which have reduced total cost of ownership improvement by up to 15 per cent due to lower maintenance costs, extended service intervals, and a design that simplifies the most common repairs. Caterpillar was the sponsor for the next category. The award for Engineering Solution is designed to recognise engineering innovations, either mechanical or electronic, that overcome particular problems or significantly advance the abilities of existing equipment. This could range from new tyres and improved drivelines to new machine types or unbreakable lights. As it turned out, the Gold winner was none of those. British Steel had looked at new approaches to descale products made from special profiles (track shoes, cutting edges, forks, mast channels and a hundred other bespoke items) so that automotive surface finishes could be applied. Descaling systems work by applying water at high pressure to hot steel. This breaks the surface scale and the water then sits trapped under the scale, superheats and explodes the scale off – all of this happening in less than a second. It is essential to get the spray headers close to the product, there being an exponential relationship between this distance and the impact energy on the material. The focus of the new descaling system is to dynamically position the descaler sprays so every product had the optimum spraying distance. Specifically, every piece is laser measured and the guides offset to around 100mm stand-off, resulting in impact energies over 300 per cent higher than when using the previous system. Atlas Copco’s Power Technique approach to reducing noise and emissions on worksites won Silver. A good example of this approach is the E-Air compressor, in which proven technologies from other products have been combined to develop an electric-powered compressor capable of meeting the demands of construction sites. Continuing that theme, Derbyshire-based manufacturer Tufftruk took Bronze for its new Truxta EV mini-dumper, a machine specifically designed for no-emission no-noise environments. This battery-powered dumper, with an eight-hour duty cycle, offers construction firms a proven eco option that can be used in any emission and noise-free environments, indoor and outdoor. Datatag sponsored this category. As plant theft remains a big problem for the industry, this award looked for significant innovation in terms of construction site security, machine or attachment theft prevention or for locating, retrieving and identifying stolen items. CanTrack Protect is purpose designed to combat the tools and techniques used by thieves to locate and remove a tracking device from stolen property. CanTrack Global’s technology can detect when it is being jammed and automatically switch to an alternative location technology. A national team of former police investigators will then physically locate the stolen asset so that police can execute warrants and enter private premises and property. The system is not only Thatcham Cat S7 certified, it also won the Gold award for Security Innovation. Stopping tool theft from vans is the intention of Amber Valley Developments, perhaps better known as Europe’s largest manufacturer of vehicle reversing safety systems and winner of the Silver award. Using technology originally developed to prevent vehicle catalytic converter thefts from vans, trucks and buses, ToolDefend monitors the vehicle’s doors with ultrasonic sound wave detecting sensors. Any attempt to breach them will result in an alarm being triggered and a loud siren sounding. GPS is optional for text messages being sent. Once again, no Bronze award was presented in this category. Silver in the Environmental category went to AJC Trailers for the company’s EasyCabin EcoSmart ZERO. Nylacast sponsored the category for innovations that are beneficial in terms of reducing the environmental impact of construction activities. They could reduce fuel consumption, emissions, noise and waste or may minimise/prevent damage to the worksite, watercourse or surrounding area. Gold-award winner Wacker Neuson’s DW15e is a zero-emission, all-wheel-drive electric site dumper with a 1500kg payload. Power is provided by a maintenance-free absorbent glass mat battery, charged by an onboard charging which just requires connecting to a 16A 230V single-phase supply. The machine will operate for a whole day on one charge, and the DW15e produces the same performance as the manufacturer’s equivalent diesel-powered site dumper, with zero emissions and reduced noise levels. Primary energy costs are reduced, compared to an equivalent diesel-powered machine, as are maintenance and service costs. Welfare units on work sites consume a considerable amount of power, usually delivered by a diesel-powered generator that often remains on full power at all times. Working in close liaison with UK’s Intelligent Energy, AJC EasyCabin has brought to the market a range of welfare units powered by a combination of a hydrogen fuel cell and an advanced solar power system, meaning that the unit operates almost totally silently and emits only pure water vapour. Impressive, and it impressed the judges too, winning Silver. The Certas Energy team collecting the Bronze award for its Shell GTL Fuel. Shell GTL Fuel is a paraffinic product which can be used as an alternative to conventional diesel. It can be used in construction plant and generators as a direct replacement for diesel, without the need for expensive modifications to engines or fuel storage tanks. Created from natural gas using the ‘Fischer-Tropsch’ process rather than being refined from crude oil, Shell GTL Fuel’s combustion properties have been proven to deliver a number of benefits including reduced emissions of harmful pollutants such as CO2, NOx and PM, improving local air quality and reducing noise levels in some engines by as much as 3-5dB. Certas Energy is the exclusive supplier of the cleaner burning diesel alternative Shell GTL Fuel and picked up the Bronze environmental award for doing so. Caterpillar was back as sponsor of Non-Operated Plant and Support Products, a products and services category open to non-operated plant and tools, alongside essential construction support products and services. Ballast dust is a problem on the railways, particularly in dry conditions, and dust suppression is a hot topic. Brendon Powerwashers has developed the Dustec DT00 which requires only a supply of high-pressure water (100-250 Bar) and can be situated up to 75 metres from the power washer used to supply it. 60 per cent of the water is used to drive the fan that then distributes the remaining water as droplets over a wide area to suppress the dust. The ‘drive’ water is then returned to the power washer and recycled. Lightweight and quiet in operation, the Dustec 400 won the Gold award. Silver went to the Kerbguards range from Ground-Guards. These kerb guards, manufactured from recycled PVC, protect kerbs from damage by plant and equipment – a major problem on new housebuilding sites where often more than 50 per cent of the kerbs on an estate will need to be replaced before final top-coating of roads and pavements prior to adoption. Despite 11 entries being received, no Bronze award was made. Dual Inventive scooped the Silver Award in the Safety Innovation Category for its MtInfo 3000 system. Key account manager Gilles Vanblarcum received the trophy. Perhaps the most important category as well as the final award to be presented, the judges had to sift through 26 entries to make their decision. They were looking for the device or system considered to offer the greatest boost to the safety of site workers, be that PPE, electronic systems or physical devices. Wacker Neuson won its second Gold award of the night. Its Dual View Truck features 180-degree rotation of the entire operator’s station, giving a perfect view during loading, unloading and transportation. Having supervised loading and unloading while having a panoramic view of the skip, the operator then turns the seat through 180 degrees and has an unobstructed view in the main forward driving direction. The Dual View Truck exceeds the visibility requirements set in the line of sight standard ISO 5006:2017. The rotating operator’s station also reduces operator fatigue by eliminating reversing and reducing manoeuvring on site. The machines feature hydrostatic transmission, allowing the operator to focus on the task without frequent gear changes, while hydrostatic braking will decelerate the machine as soon as the operator takes his foot off the accelerator pedal. The travel speed is 30km/h when in the main forward driving direction, reducing to 15km/h when looking over the skip and 8km/h when reversing. 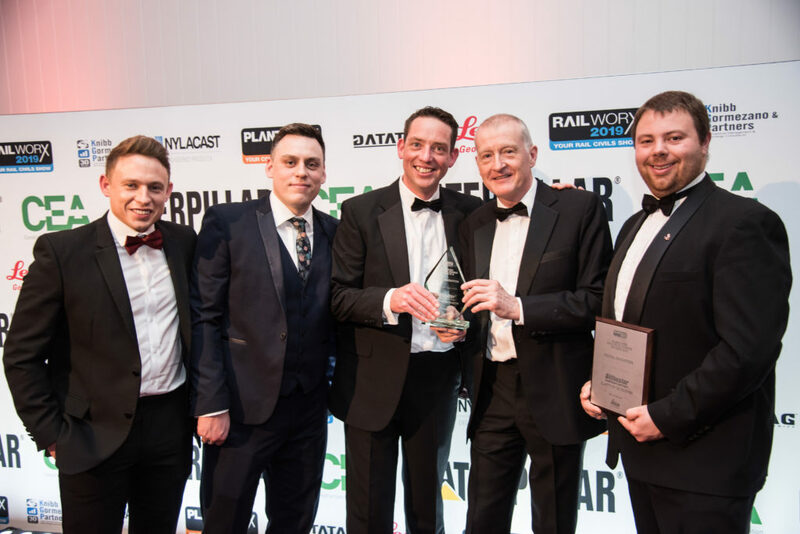 The Silver award was presented to Dual Inventive which has developed the next evolution of open railway interlocking systems, one which is not solely focussed on the safe movement of trains but also designed to provide the highest levels of protection for staff on the tracks. As the interlocking is directly controlled by the protection staff in the field, they no longer need enter the track to set up their protection. Classified as a Signal Controlled Warning System (according to EN 16704-2-1), the MTinfo 3000 system uses the train position data received directly from the interlocking to warn trackworkers of approaching trains, meaning that they always have adequate time to reach a position of safety. A new, simplified safety system developed by GKD Technologies won Bronze for safety. Designed to support its range of motion safety indicators, GKD adapted its trusted and unique algorithms to provide a height and slew system combined into one slim lightweight display. The SensorHeight&Slew system uses reliable hardware platforms, supported by software developed in-house to measure the real-time movement of the machine dynamically, including the boom and slew positions, to ensure that pre-set limits are withstood. That concluded the awards for the evening. 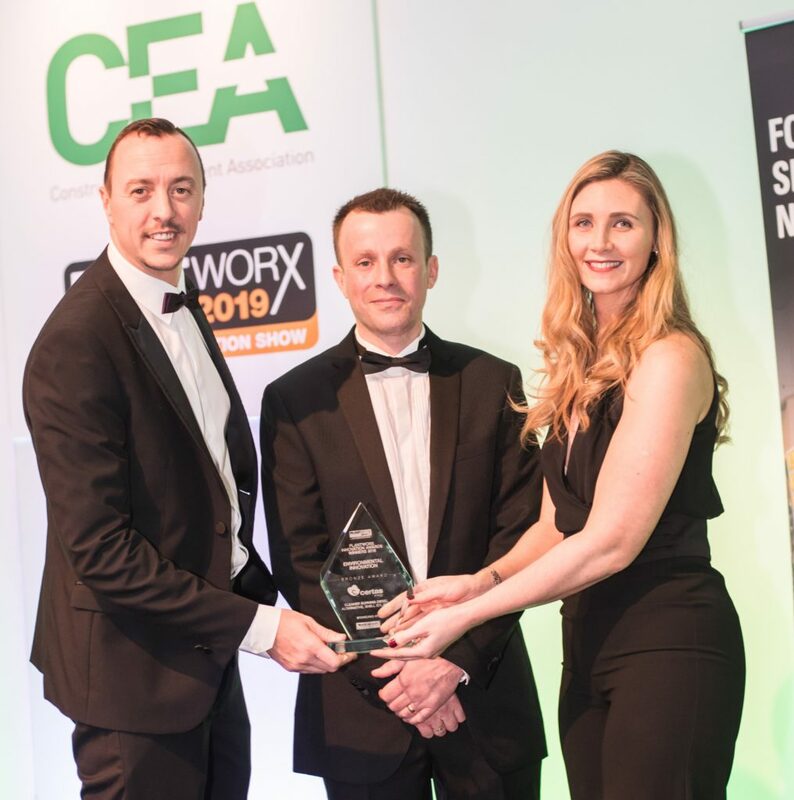 In congratulating the winners, and commending those that were unsuccessful as “we are all winners here”, the CEA’s Rob Oliver wished his audience well and looked forward to seeing them at Plantworx/Railworx at the East of England Arena on 11-13 June.